After over a decade in this business, I have learned that the most important aspect of a reception is the entertainment. The entertainment is the last thing your guests experience at your reception. It’s what they go home remembering. It’s what they talk about for the next week. It’s what the pictures will be of on Facebook the morning after. With Now That’s Entertainment, you always get me, the owner. You book with me, plan with me, and I show up the night of your reception. If having a relationship with your DJ is important to you, Contact Me, and let’s start working together today. I do many things throughout the evening to make your reception amazing, but I also allow you to customize your event with unique add-ons that will make your night special, and give your guests something to remember and talk about for years. Everyone’s needs are different, and I give my clients options to fill those needs. I developed my add-ons as clients asked me to solve problems for them. Problem: I was at a wedding recently, and the kids were running around like crazy. They almost knocked over the cake and drinks. Solution: Now That’s Entertainment Kids Package. This add-on is for the bride and groom who will be inviting guests with children (3 years old to 10 years old). This package has multiple parts. I would be happy to discuss the details in person or over the phone, but to summarize, I make sure the kids are occupied during the parts of the night when they typically get restless. This is one of my most popular add-ons, and it has been successful in countless weddings. It can truly be a reception-saver. Problem: I want to make an impression. I want to create an “Aw!” effect as we come out on the dance floor for our first dance or as our guests come into the reception hall. Solution: Custom Made Gobo. Sometimes, a picture is worth a thousand words. So take a look at the picture below. 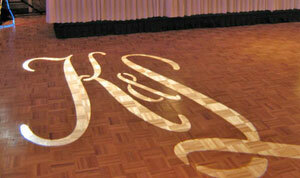 Imagine your name illuminated on the dance floor or on a wall of the reception hall as your guests look on. It will make your guests gasp. Problem: We want to play a slide show. How can we make sure the guests can hear the music as well as see the pictures? Solution: Now That’s Entertainment offers a projector and screen rental at a reasonable cost. I also ensure your guests will hear the music behind the pictures as it’s all played through the same sound system used for the rest of the night’s entertainment. Want a slide show but don’t know how to make one (or don’t have time)? I can create an amazing slide show for you. You get 5 copies of your slide show on DVD to keep for yourself and to give to parents/grandparents. Problem: We are having our ceremony outdoors. It’s really expensive to hire live musicians to play our processional and recessional music. Solution: I can set up at your ceremony site and play your prelude, processional, recessional, and other music needed for your ceremony. It’s MUCH cheaper than having a separate service provide the music for your big event. I hope your ears weren’t ringing for a week after the wedding. EVERYONE was talking about you. Let me tell you, you were a hit. Everyone loved you. We couldn’t have found a better DJ service if we tried. We have recommended you to lots of people already. A couple of my bridesmaids suggested you to some of their friends as well. Even one of the groomsmen mentioned how great you were, and NOTHING makes that guy happy. So thank you so much! We would definitely hire you again and again! Keep up the good work, and our Memory CD is way cool. I couldn’t be happier! I’ve been proudly showing everyone I know.